The child’s development is a challenging stage with parents. Children’s problem with eating causes many parents to bother. At this point, your children are gradually developing new skills, reveal personality so there are many problems occur. In term of the eating, many children do not like the parents to feed them with a spoon and want to eat by their own. Therefore, food is easily fallen off on the ground. Today, we will introduce an useful product for young parents to deal with this problem. Your children will be given a chance to eat on their own and the food won’t fall on the ground. Sounds so interesting! The Gyro Bowl is a special bowl for kids that was presented in late 2010. Thanks to its unique design so that the “bowl” turns 360 degree without spilling the food. This is an exceptionally smart bowl and perfect for your children. 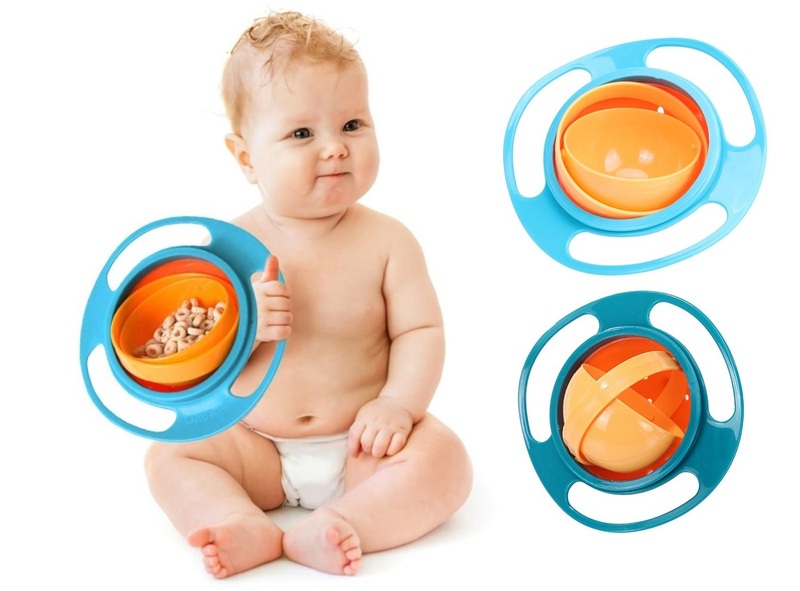 Gyro Bowl is also a special, educational toy for kids which is smartly designed to stimulate the baby to discover and enjoy eating in the bowl. The product is made of special bactericidal plastic for the health of your littile angels. The good quality makes the bowl hard to be broken if the baby throws it away. In particular, the bowl is dirt-proof and anti-spillage when the baby is looking for fun in the bowl. Products manufactured by quality standards and exported to the Japanese market is a powerful tool for the mother to raise their kids. – The Gyro Bowl is particularly safe with your baby and is durable enough to hit the ground. This is an exceptionally smart bowl and perfect for your children. Made of safe plastic, absolutely friendly environment and sensitive skin of the baby. Designed with 3 layers: plastic bowl, plastic support and plastic handle. Can hold horizontal, vertical, even put bowl down without worrying food in the bowl is poured out. Special design can include food items such as cut fruit, nutritional cakes and snacks. – The cup has a sturdy hand grip so your baby can carry it around the room and avoid dropping the food. A toy, household appliances indispensable in every family. Product size: diameter 13cm x height 6cm. 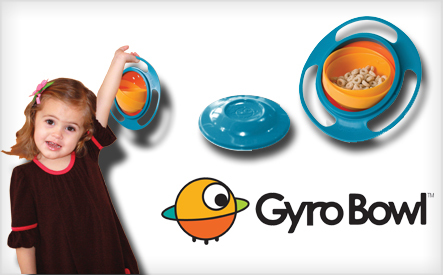 Gyro Bowl is a child’s favorite bowl at eating time because it is also a baby toy that can be taken anywhere and take food at any time … in the hands of little kids. Moreover, it keeps the food clean inside, not easy to fall or pour when baby moves. 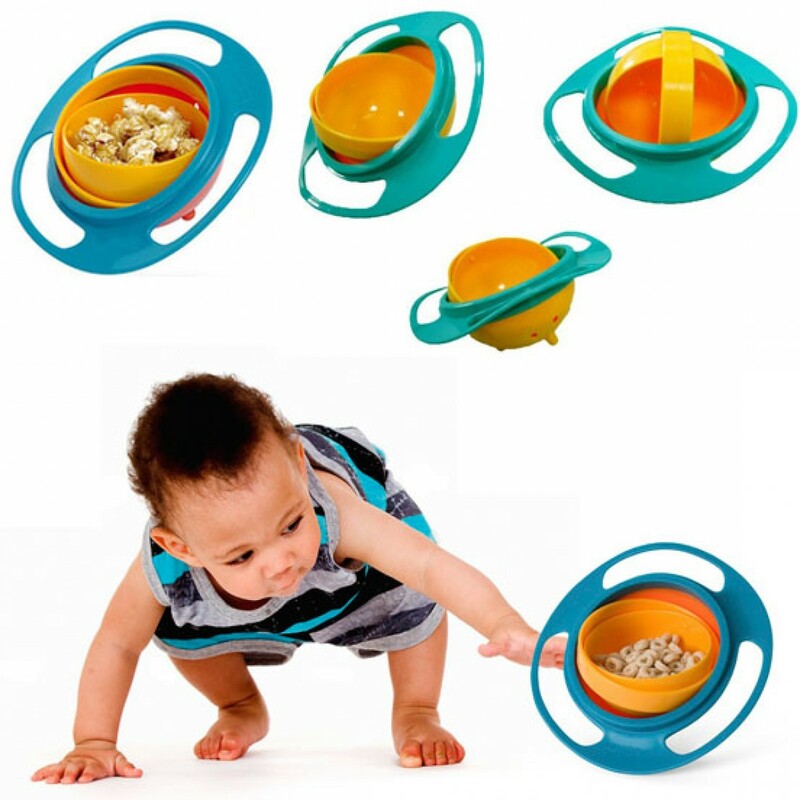 The Universal Gyro Bowl with its eye-catching color and design in the form of a toy, the baby will be delighted and help parents reduce the pressure and time when feeding their children. 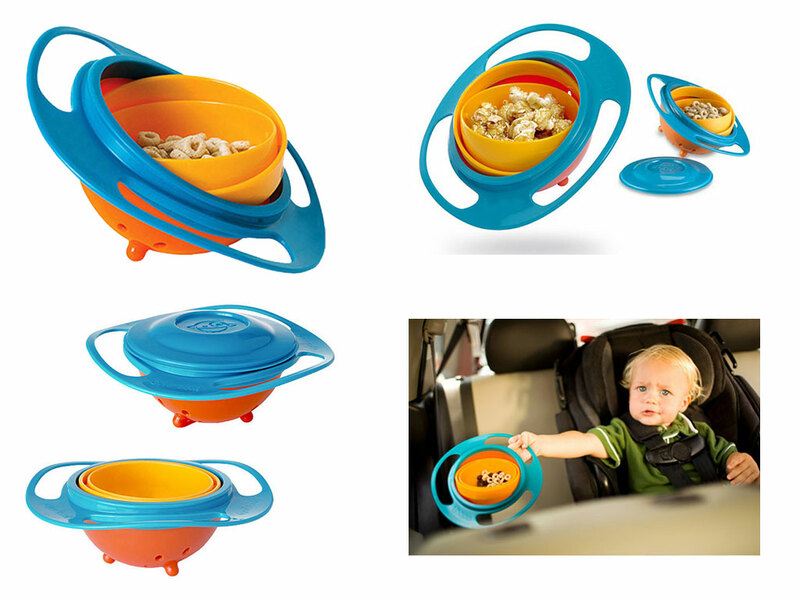 Parents no longer afraid to drop the baby food at home when feeding with this balanced food bowl. 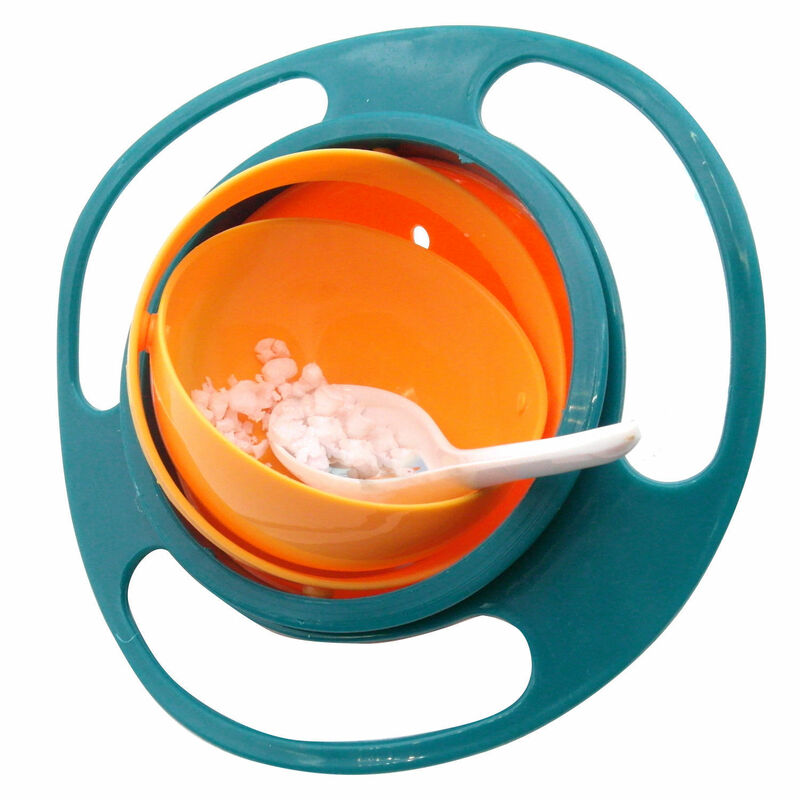 Parents no longer afraid to drop the baby food at home when feeding with this balanced food bowl. Moms and children not to have a “fight” between meals. This product will put an end to these “battles”. The mother should have enough patience, respect the opinion of children and especially give the children the Gyro Bowl. Gradually, your children will recognize the meal as a time when the whole family is happy and unite. Jim G: A fun little contraption for kids. We bought a gyro bowl for our 1 year old a month ago as a gift, and we just finished ordering another one for a friend and her toddler. We have found it to be easy for our kid to hang on to it while he’s snacking in the car. The lid included with the bowl is a feature that comes in handy more often than you think it will, especially for when you are on the go. Just be ready to clean the inner and outer bowls. It’s not too much of a hassle, but it’s helpful if you are aware of this before you put anything in the bowl that would potentially be too messy to clean up if it gets in between the two bowls. If things do get really messy, you can always take the bowls apart and clean them separately, then put them back together. Overall, the gyro bowl is worth the order price in my opinion. Rachel: My hubby and I bought the gyro bowl originally for our 14 month old toddler. Once the bowl arrived in the mail, our little girl’s dad probably got more of a kick out of it than she did. When dad finally let her play with it, she loved it. She always seems to have it around her now. We have found it works terrifically for cheerios and other cereals. We had one incident where the bowl was knocked off of our kitchen table by daddy who was setting another plate down. Sure enough, things spilled. But that’s to be expected. Overall, the gyro bowl is a lovely little product and we’d happily buy another one if needed. 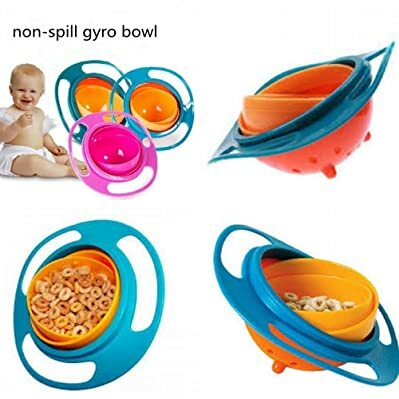 Jason: I wanted the gyro bowl because my little one is always finding a way to accidentally spill her meals and snacks all around the house. You name the room and you could probably find the remnants of a stain caused by the spillage from my child’s shenanigans. As far as I can tell, this product does just what the commercials say it can do.My one reservation is that the bowl really needs to be held properly so that food doesn’t come out. My kid was holding the gyro bowl with her thumb wrapped around the inside bowl which kept the “gyro” part of the product from doing its thing. I showed her how to hold it the right way without things spilling, or “how daddy would hold his food.” Now, she grips the bowl by the rim and we have seriously cut back on a lot of spills in our house. Jerrlyn: I got this gyro bowl as a gift on my first Mother’s Day as a mom from a thoughtful friend. She ordered it and had it shipped directly to my house. The bowl arrived inside its original box which was inside a much larger box. I think the extra space inside that box is what caused there to be a few dents on the inner box. But the bowl itself was in perfect condition. I love the bowl and I think the concept is great. Liquids seriously should not be used in the bowl if you’re worried about spills. The gyro bowl so far works fantastically for dry foods, but once you put any liquid in there and shake it around, messiness is inevitable. However, just like any other ordinary bowl, you can put liquids in there if you aren’t anticipating you or your toddler tipping or spilling it. Yes, the bowl is spill resistant, but it isn’t magic. It’s a fun little gizmo that is worth the sticker price. My kid loves it, and I have even played with it a few times already. Buygyrobowl.com is a participant in the Amazon Services LLC Associates Program, an affiliate advertising program designed to provide a means for sites to earn advertising fees by advertising and linking to Amazon.com. Buygyrobowl.com is a participant in the Amazon Services LLC Associates Program, an affiliate advertising program designed to provide a means for sites to earn advertising fees by advertising and linking to Amazon.com.